Some kids can’t seem to stem the flow of creative ideas when it comes to storytelling. Others can’t think of a single thing to put into a story. Kids in both categories, as well as everyone in between, will love The Storymatic Kids!, a storytelling game sure to get your creative juices flowing (and flowing and flowing). Play is simple: Pick a few cards from the box and let your imagination run wild as you create a story. Yellow cards contain characters and blue cards display miscellaneous story elements like settings, situations, or items. There are also wild cards so players can include their own ideas. Some of the suggestions on the game’s homepage include giving the game to early writers, parents in need of ideas for bedtime stories, teachers of creative writing, and grandparents who want to interact with their grandchildren. But the possibilities are practically endless. Why not tell a group story, in which each person draws a card and uses it to add another few sentences to the story? How about making a comic strip with the ideas on the cards? Wouldn't these be perfect for an evening of improv games? The game comes with 360 different cards and a booklet containing prompts, specific games, and other suggestions. But The Storymatic is so versatile that there’s really no wrong way to play and no reason to play by any rules except the ones players set themselves. 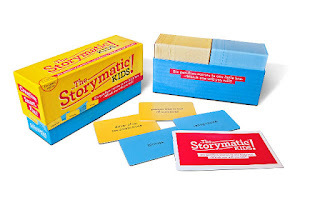 Various versions of The Storymatic are available at toy stores, from Amazon, or through the company’s homepage. Beth, I think that this is a great idea. The kids love telling stories and this is a great way for them to get ideas. What I love the most about the game is that there is no fancy technology. The fun is all up to their imagination.